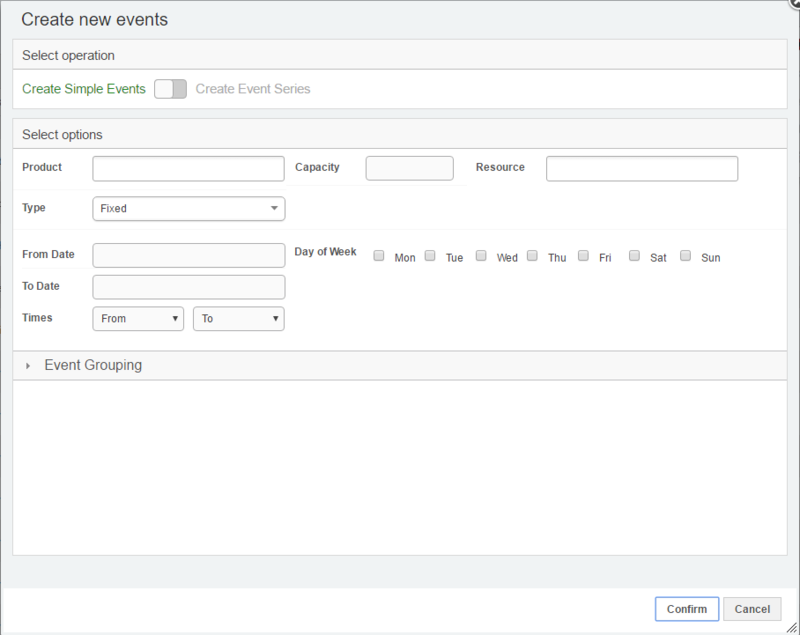 The Create Simple Events action allows you to create a series of Events that fit a regular weekly pattern. 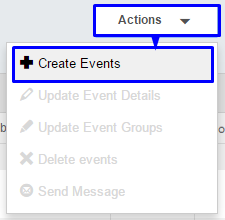 To use the Create Simple Events action, click on the Actions dropdown to the top-right of the Events table, and then select Create Simple Events option. The Product that is being used for this event. The maximum number of people who can be booked onto this event. The Resource that is being used for this event. (dd-mm-yyyy) The start of the date range of Events you are creating. (dd-mm-yyyy) The end of the date range of Events you are creating. Select the days of the week that you want to create the Events on. (hh:mm) Use the Drop-Downs to select the Start and End times for the Events you are creating. This option is used to add the Events to a new Event Group. This option is used to add the Events to an Existing Event Group. When using the Create Simple Events option, you will be able to create multiple Events across multiple days. If you want to create more than one event on each selected day, then you can select multiplt Times options. Once you have selected a From and To time, the system will then provide you with an additional option for Times. This can keep on going until you have selected all of the Times that you wish. I.e 10:00 - 11:00, 11:00 - 12:00, etc. You can use this system to also create Available Events for use with Template Event and Room Booking Products. To do so, just change the "Type" from "Fixed" to "Available", and ensure that you select all of the applicable Products.